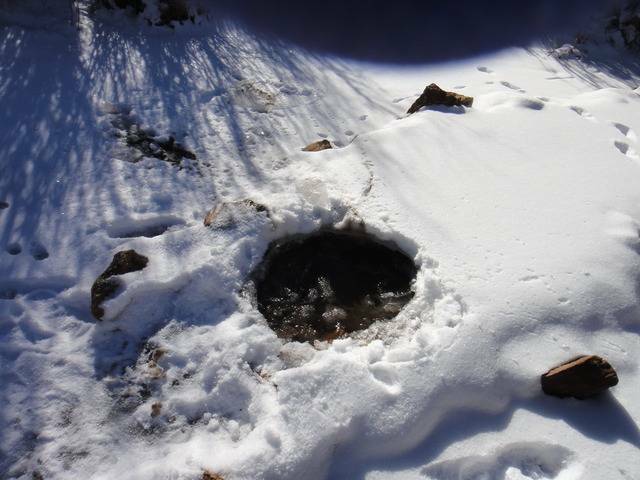 My goal was to see just how bad, how snowy, how frozen things were since I was up there last. The hills and roads definitely had more snow than around my house. Lately, we've had some cold nights.........with minus .4 F, minus 1.1 F and this morning a balmy 5 F.
Still, my guess was Cache Creek was flowing below the ice and IF I could get the ice busted up enough...............MAYBE I could get my sluice to flow and I'd just shovel in creek bed material and "mine the miners" for any lost gold from the summer/fall. 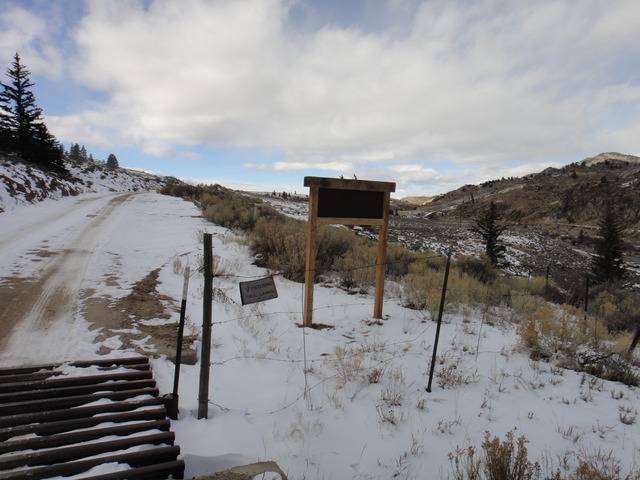 Well........I got to Cache Creek about 11 AM and about 20 degrees F. No surprise, I was the only one there. 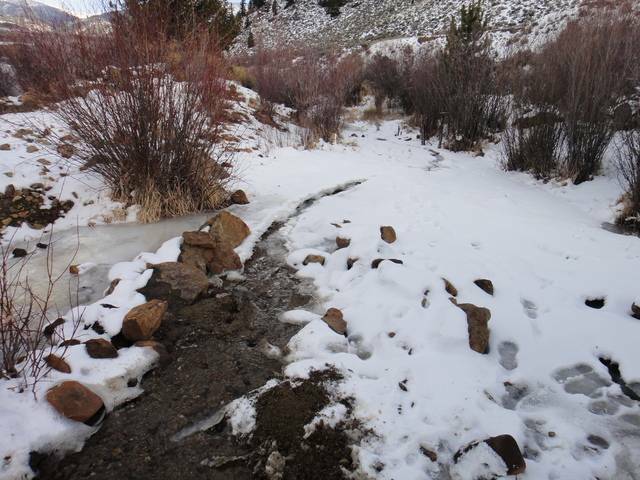 The roads were only about 1/2 covered with any snow and NO problem going up CR 398 in 4-WD. So, I just cracked & spit my sunflower seeds, sipped my water bottle and "worked" for about 1 1/2 hours.....just a scraping, walking back/forth and feeding my Le Trap. Never got above freezing. 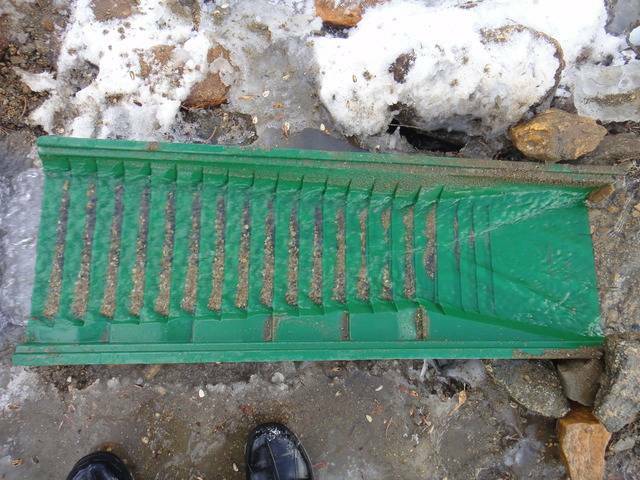 Funny to see the ice and dirt build up on the sides of my sluice box. As I fed in the material from different spots I could occasionally see a super tiny speck of gold here and there on the bottom of the flair. Really, pretty poor. 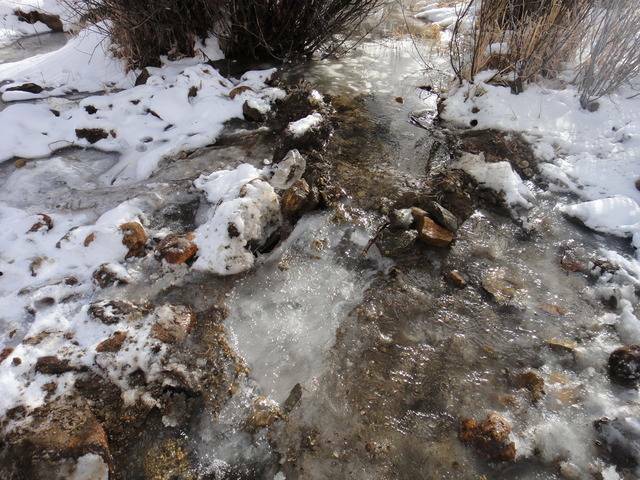 BUT, I was there, I was sluicing... Just proof again to idiot BLM that folks CAN prospect all year around at Cache Creek. Nope. Never saw a single "wintering" Elk the whole time. Not a track, not a turd, no browse marks.... Once again, BLM just using innocent animals & plants as toadies in their endless quest to serve ONLY eco-Nazis and run all the rest of us off OUR public lands. Criminals all. I hope President Trump fires them all............all.............and we start over with smarter people with common sense and brains and BLM then follows the law as to "Multiple Use" as dictated by Congress. 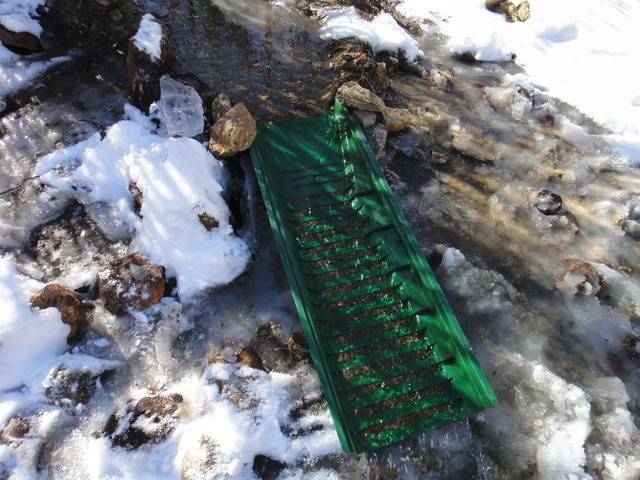 After I pulled my sluice up and washed the cons into my green bucket, here's the spot I had it setup. Notice the ice. Ha! 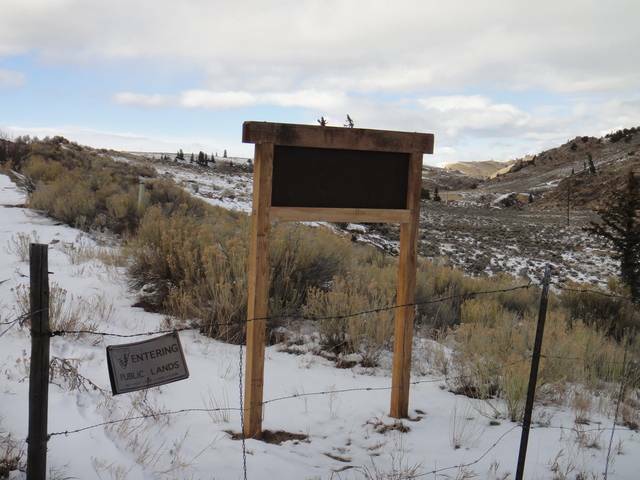 It's BLM's latest effort to soon post new signs announcing the "implementation" of their latest EA/Mgt Plan that they crammed down our throats as lapdogs to the eco-Nazis. All unnecessary, onerous, unfair and downright criminal! We already fund BLM 100% year after year with over $1.2 BILLION of our tax dollars to "manage" (truth be told, totally mismanage) our public lands. To charge us all twice for doing their jobs once is criminal. It's fraud and Larceny. All so they can confiscate our equipment, threaten us with fines and jail time now. THEY are the criminals, breaking the law and not fulfilling their Congressional mandate. 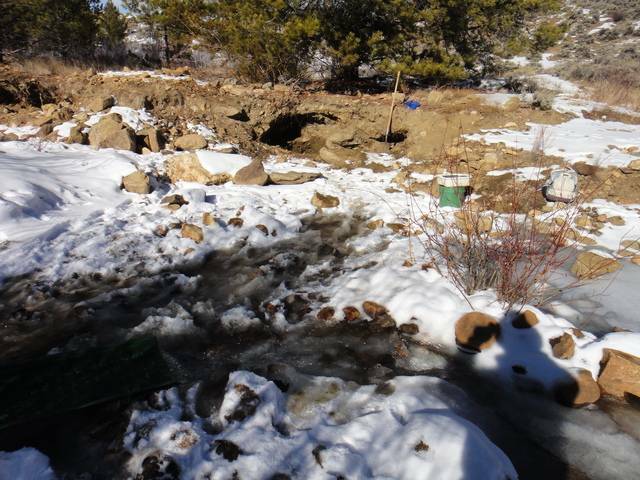 Anyone wanting to help "save" Cache Creek from BLM can call/e-mail/write Congressman Doug Lamborn and Senator Cory Gardner and kindly ask them to IMMEDIATELY take action against the Canyon City BLM Field Office from cramming their new "plan" down our throats and running us off OUR public lands. 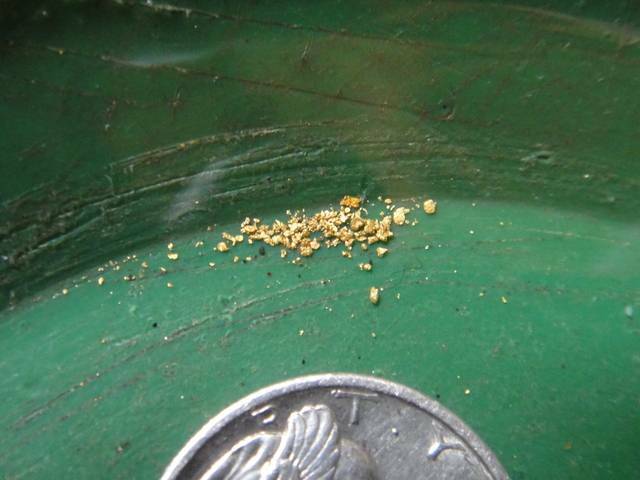 Cache Creek is the site of the biggest, longest running hydraulic gold mine in Colorado State history. Idiot BLM wants to run us off, make into yet another plant & wildlife preserve, which we have way too many of already. Here's links to two short videos I made, posted to my YouTube Channel. Enjoy! I'll update this Trip Report once I get my cons panned out. I am NOT expecting much. Just "doing it" was the reward. Not a bonanza.....BUT, I didn't get skunked! Well looks a little chilly, but I wish I could have been along side sharing in a little "Hard Fun". Time is running out, I'm afraid the New Year won't be prosperous at Cache Creek, another Chapter of the Good Old Days are gone for ever. It is obvious that even though BLM is soliciting comments on their Draft Plan they don't plan to even seriously consider any of them because they are moving full speed ahead to implement their ridiculous new restrictions. This may just be the last C-17A or any video that we see sluicing Cache Creek; Please act immediately!!!!!!!!!!!!!!!!!!!!!!!! The ONLY reason they are soliciting comments is that they are REQUIRED TO BY LAW!! and ALL comments are filed in the "TC" file for latter handling! I hope Trump sends a lot of these guys (that want to make their own rules) PACKING down the road ! He needs to go through the Dept. of the Interior with a fine toothed comb! slick willy and al bore had their D.of. I. guy babbleing bruce babbit and he brought in 1000s of greenies to get a job and that's when our troubles started in FULL BLOOM!